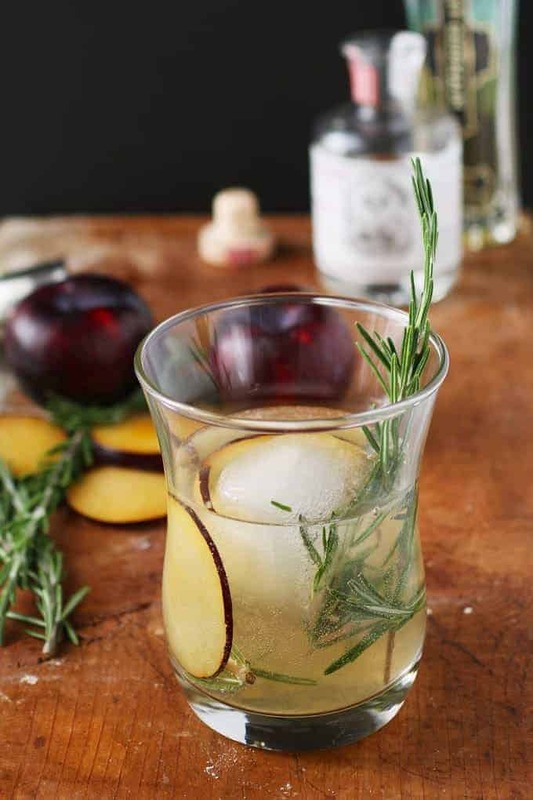 This plum gin cocktail is a blend of fresh ingredients and aromas. Thanks to the addition of fresh plum and St. Germain there is no need to add any additional sugar. After a week in Sicily and a constant stream of very good wine, I am surprised by my desire to drink a cocktail. Maybe I am feeling a need for change of pace after the constant cool breeze, hot Mediterranean sun, and access to 400 varieties of Sicilian wine. It sounds as wonderful as it was. You may be expecting something Aperol or Campari based but instead I am going with St. Germain and gin. I wanted to create something fresh and slightly sweet. Thanks to the addition of muddled plums and fresh rosemary, this cocktail which I have named “Rosemary’s Plum,” fits the spot. It’s also the perfect drink to sip on while going through the pictures I took on my trip – over 2000 images to organize and edit for my upcoming stories. I imagine I will be coming up with several more cocktails during this phase. 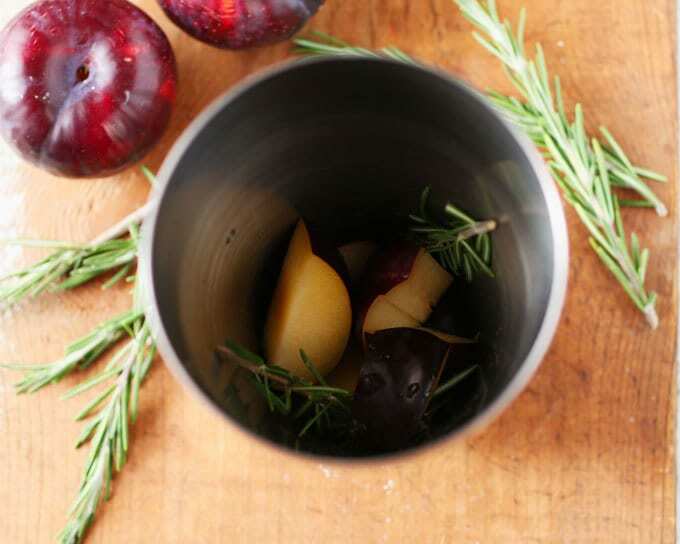 To create this cocktail, I first muddled some plum slices, fresh rosemary and a splash of soda water. I enjoy muddling – its equal parts therapeutic, athletic and homeopathic. The repetitive hand and arm motion mixed with the aromas is something I will never grow tired of. 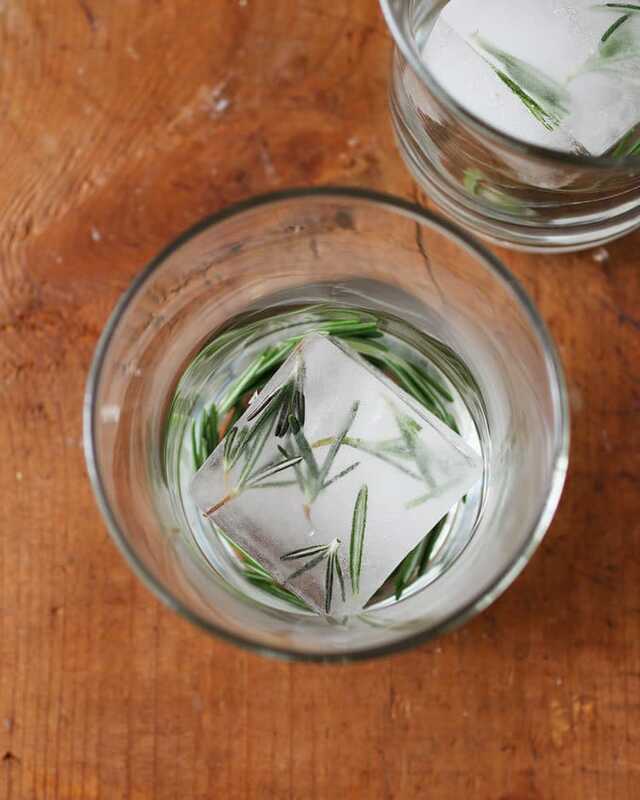 For aesthetic reasons, I froze some rosemary in a giant ice cube tray. I should have used distilled water for maximum effect – the ice cubes would be clear. Alas, future cocktail goals have now presented themselves to me I suppose. After muddling, I add several ice cubes to the mixture along with the gin and St. Germain. For gin, I opted to use St. George’s Dry Rye. It’s peppery accents are exactly what I was looking for to pair with the fresh plum. I shook all of this vigorously. Maybe the shaking eliminated the need to muddle but I don’t care. I wanted to muddle. If you feel this is all overkill, feel free to stir instead. 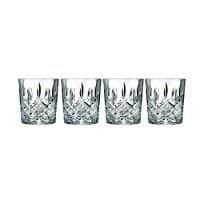 Add a few ice cubes to a glass and then strain your cocktail over the ice. 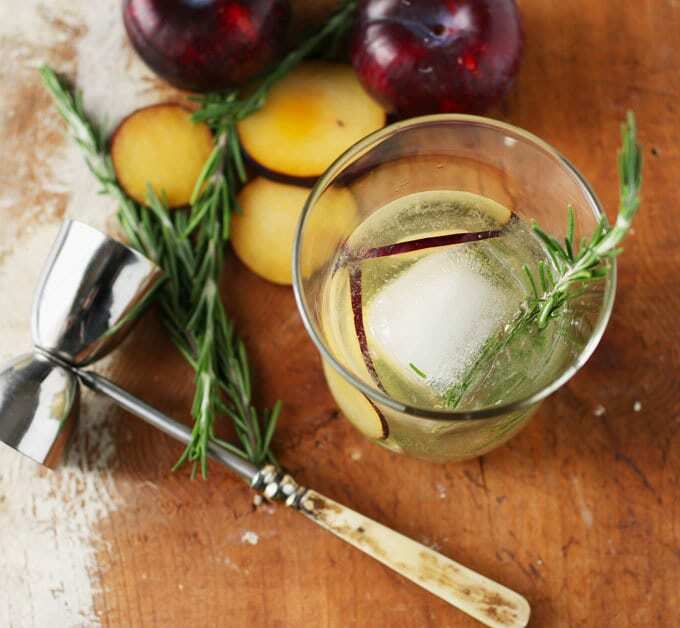 Top with soda water, garnish with a rosemary sprig and a slice or two of plum and enjoy! 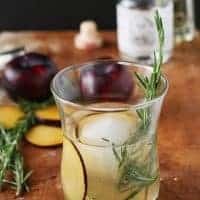 This cocktail is fresh and herbaceous..
Rosemary's Plum gin cocktail is a blend of fresh ingredients and aromas. Thanks to the addition of fresh plum and St. Germain there is no need to add any additional sugar. Instead, I pair it with gin and rosemary for a fresh and herbaceous drink. Add several ice cubes, gin and St. Germain to the shaker. Shake or stir vigorously. Add ice cubes to a glass, then strain shaker mixture over the ice. 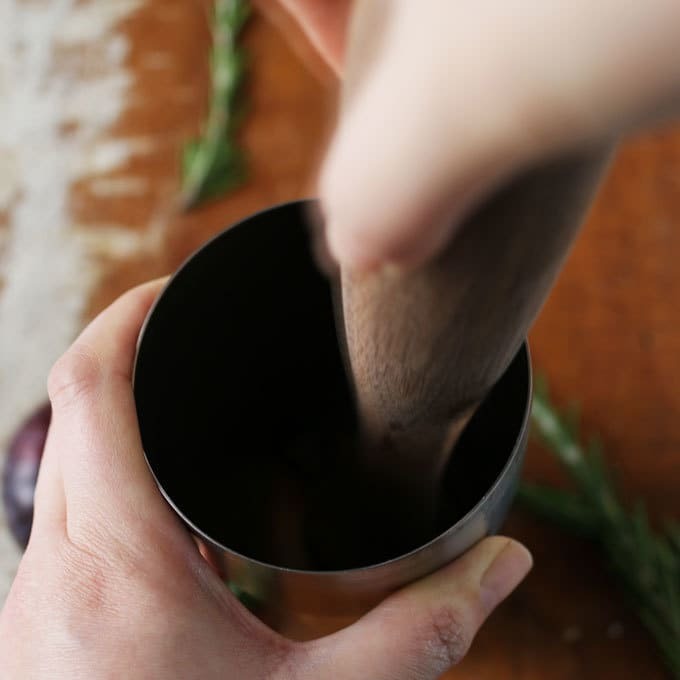 Garnish with plum slices and/or rosemary sprigs as desired. 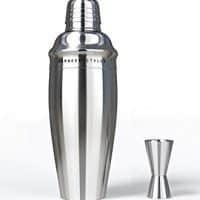 Looking for more cocktail recipes for your muddler? 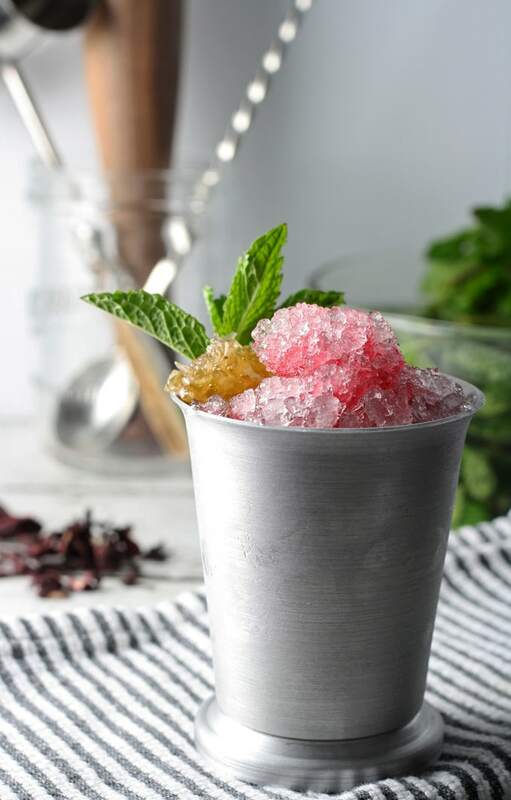 Try my hibiscus honey mint julep! 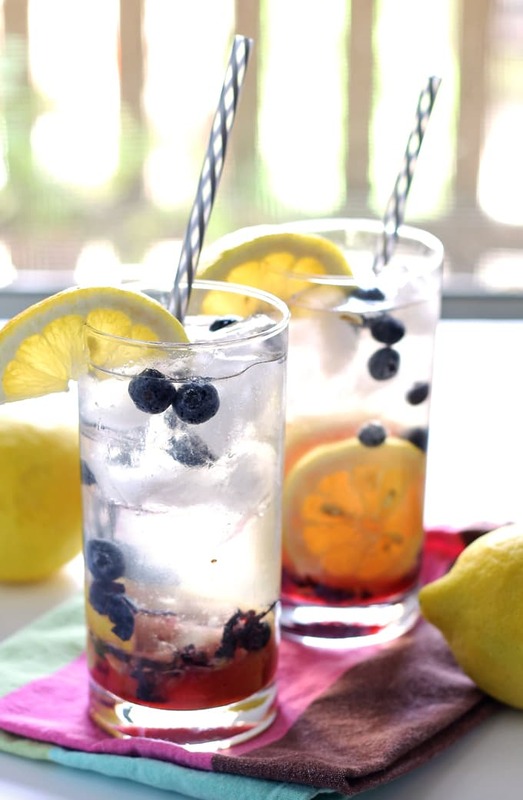 Or my blueberry lemon smash rum cocktail! 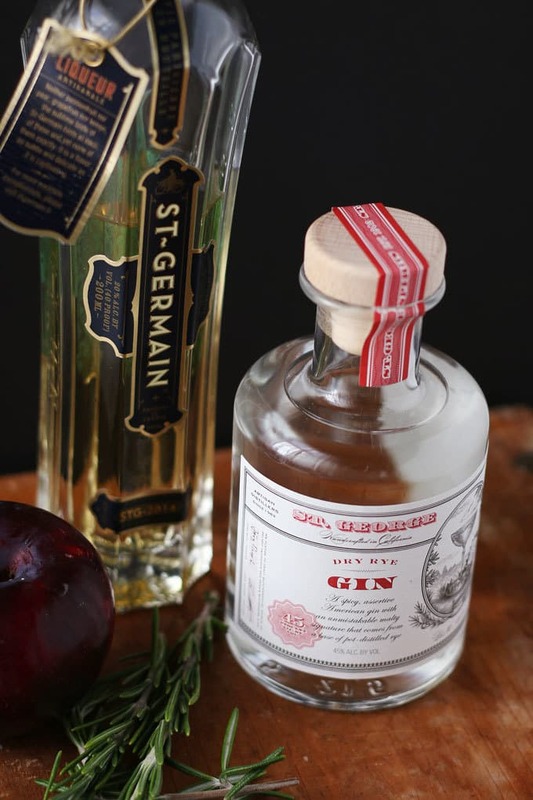 I’ve been wanting to try St. Germain for years and don’t know what’s taking so long! With this recipe and lovely pictures you have convinced me that it’s time. Sounds delightful with the fresh fruit and rosemary. Thanks for sharing on Creative K. Kids Tasty Tuesdays. I’m a big fan of cocktails with rosemary. This one looks delightful! Such great photographs too! 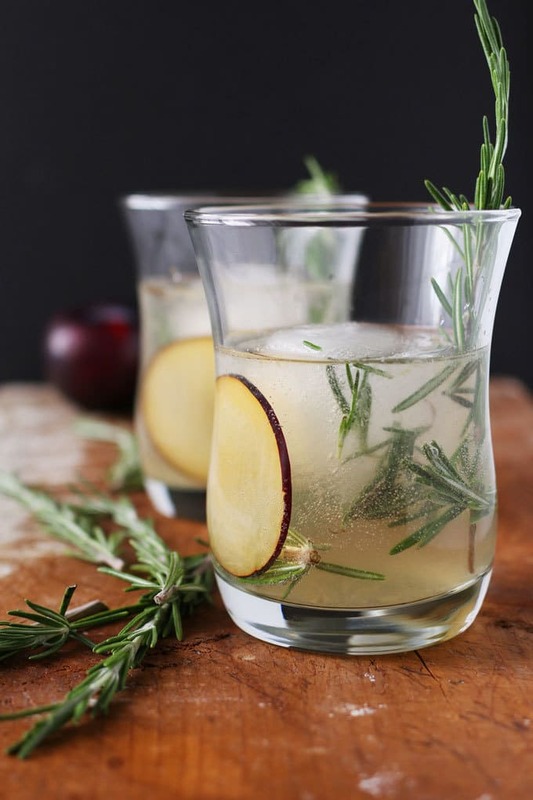 I love anything with rosemary and this drink sounds really delicious! Thanks so much for sharing your recipe with us at the Share The Wealth Sunday blog hop! Thanks for introducing us to this! It sounds fabulous!! Looks delish and thanks for sharing on Throwback Thursday! I’m trying to think of a funny remark about two saints and a mixer but I’m only half way through my first cup of coffee. So, I’ll just say…I love this cocktail. Thanks for bringing it to #SaucySaturdays. I hopped on over from Saucy Saturdays! What a gorgeous and delicious sounding cocktail! I’m visiting my “kids” in New Mexico, and we’re thinking about making this tomorrow for a get-together… Lovely! Pretty pictures, I’m not a big drinker, I’ll have a glass of wine everynow and then, but your pictures are convincing me to give this one a try. Pretty pictures, I’m not a big drinker, I’ll have a glass of wine every now and then, but your pictures are convincing me to give this one a try.